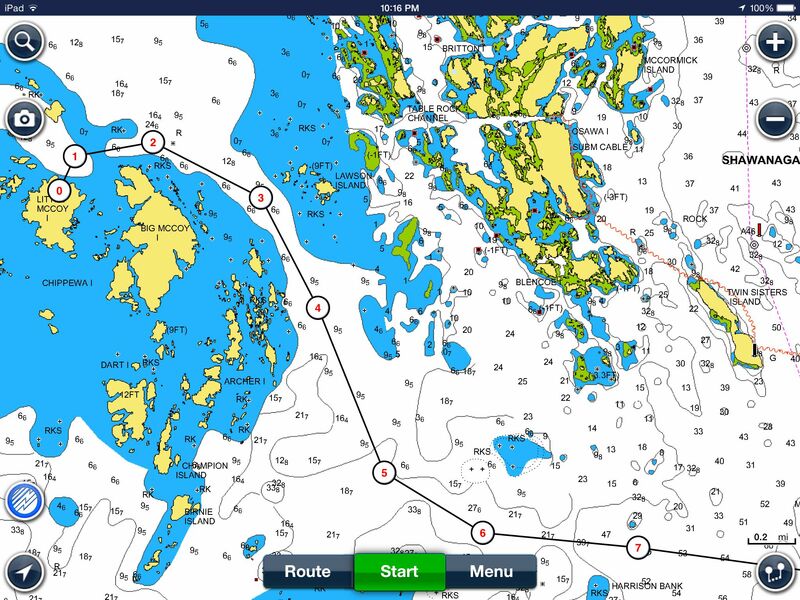 In a series of reviews last year I looked at how iPad apps from Navionics, iSailor and iNavX made it much easier to head off the small craft routes and explore some of the thirty thousand islands. 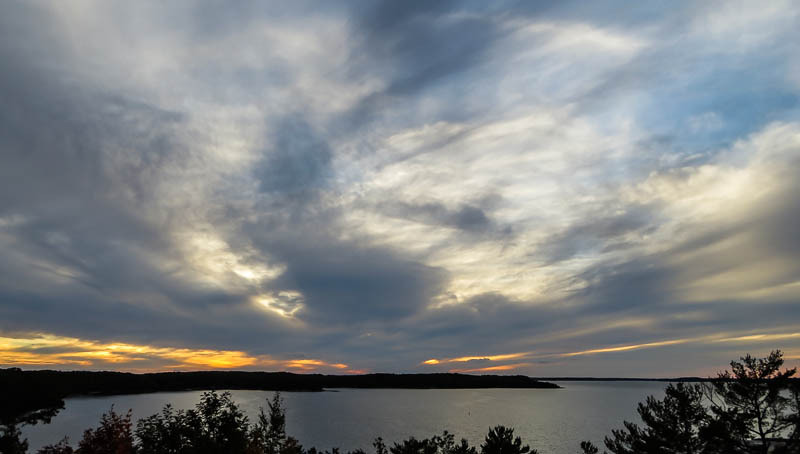 Well these apps are great but they are not perfect as I found out last weekend on a trip from Parry Sound to Little McCoy Island (45.458303, -80.481705). 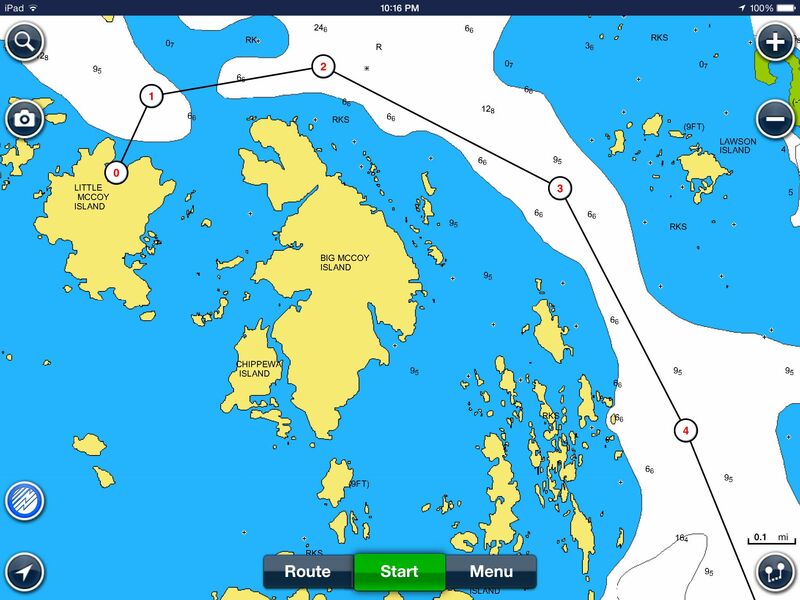 This was a new destination for us and I spoke with couple of people about the best route to take as well as consulting with the Navionics and iSailor apps on my iPad. On route I was careful to ensure I stayed on my planned route using the Navionics app. Here’s a snapshot of the path once beyond the charted small craft route. The darker blue represents a depth of less than 6 feet while white represents depths of more than 6 feet. Boating with our 21-foot Scout and 150-hp Yamaha outboard I’m pretty comfortable with depths of 4-feet or more, and right now we are dealing with water levels at or slightly above chart datum. Heading west of Franklin Island towards Little McCoy. Here’s a closer look as you approach the McCoy’s. It’s pretty obvious that there is a safe seam running east of the McCoy Islands with issues just as you approach Little McCoy Island. Or so you would think. Looking closer (below), Google Earth can explain what I ‘discovered’ on my way in and out of Little McCoy. It’s pretty obvious that there is a seam in the channel that is consistent with the Navionics charts. But they are not perfect seams as you can see looking a little closer. I’ve tried to approximate the ‘ding points’ on the Google Earth projection and you can see what I discovered with the bottom of my outboard. What Navionics didn’t catch were the several shallow points in the area identified as 6-feet or deeper. 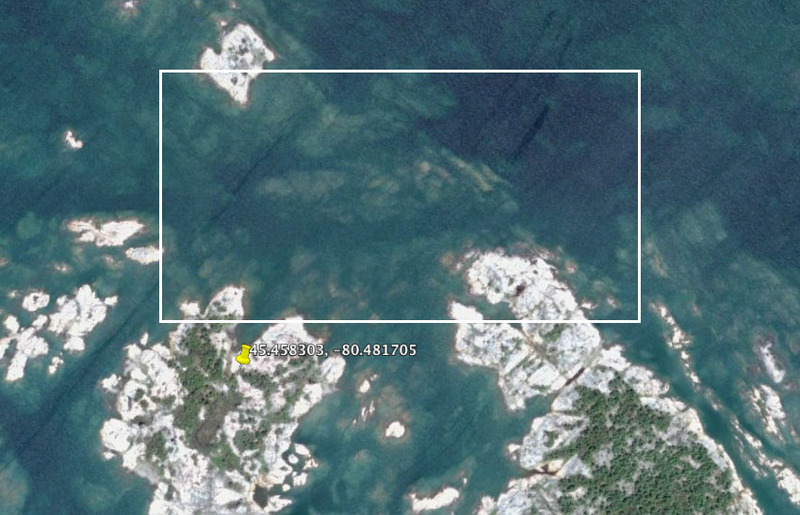 No criticism of the app, they can’t be expected to have information on every square foot of Georgian Bay. 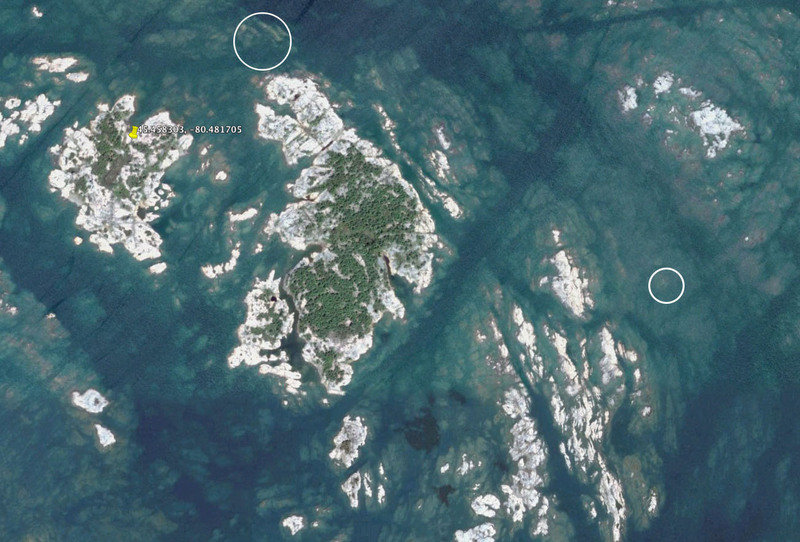 What is interesting is the area north of Big McCoy Island (below). Contrary to what is indicated by Navionics it seems the safer route is closer, not further away, from the island. Lesson learned and a look at Google Earth will be part of my standard operating procedure when wandering too far off the well charted areas. Actually I will pay better attention to the Google Earth information and plot some of the more challenging points on the Navionics charts. The irony is that I did look at the Google Earth maps before heading out but failed to look close enough and map it against the Navionics chart data. Google Earth and Navionics seem to be a natural fit and worth exploring before heading out. Whatever type of ding the prop and skeg took it didn’t impact performance on the way back, but I haven’t yet had the courage to tilt the engine forward and take a look. A short report from the Squadron’s Executive Officer – John Mason. Pauline and I have been on three river cruises in Europe; this was different but just as good. Our state room had a queen size bed, a bunk for Xavier, and a bathroom with shower. Quite big enough for the trip. St. Maarten, Nevis, Dominica, Les Saints, Guadeloupe, St. Barts. Each day we stopped on one of six leeward islands. As well as possible tours ashore there were options for rafting down a river, zip lining through tropical forests, snorkeling through reefs, that kind of thing; or you could stay with the boat for wine tasting, water sports, including a ride to a nearby beach to swim and snorkel. The days could be full. The week on the boat can best be summed up by Xavier who said day after day, “This is the best day of my life!” His best days included tubing down the rapids, climbing the mast, learning to scuba, (he reported he could live underwater) and, even I have to admit, some of the very best meals. There was a choice of three chef prepared dinners each day. If chicken, Chateaubriand or lobster were not to your taste, there was a steak or veggie dish. Five or six meals or snacks through the day – just what a growing boy needs. Pauline and I agree it was an excellent trip AND the Green Flash exists. 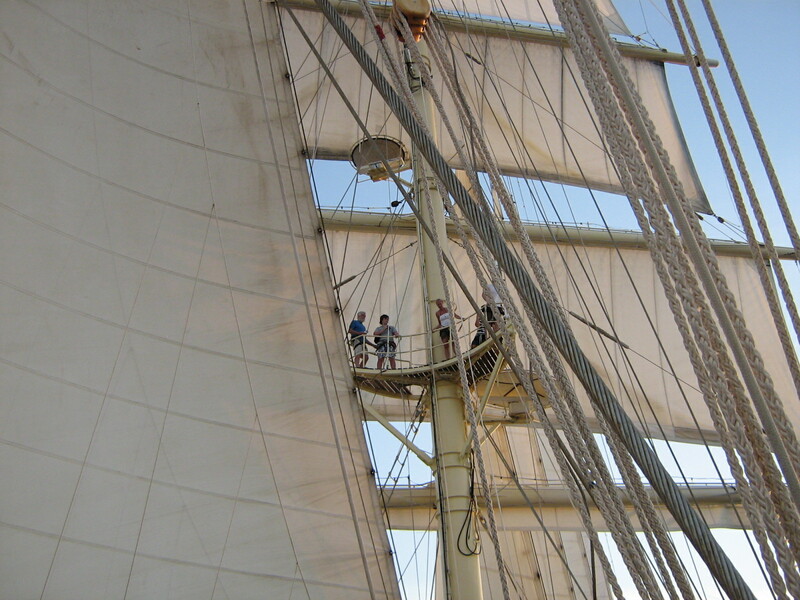 As I climbed down from the mast I stopped to see the sunset. After years of watching for it, it happened. A small flash of green in the center of an orange Sun. I saw it. I am ready to do it again. To get out of the way of hurricanes and catch the lucrative Mediterranean market, the boats are repositioned twice a year. I have always looked forward to sailing across the Atlantic and I now think this would be a way to go. Want to come with me? There are so many things our boating courses do not teach, like placing a coin under the mast brings good luck. A well flattened quarter under my mast attests to the truth of this. Thirty years I’ve sailed Canadian Mist – so far so good. And, it’s also bad luck to leave port on a Friday. I have never found an explanation for that one. I think it was that if you leave Friday you show your intention to not make it back for church on Sunday. Or, perhaps with the setting of the sun on Friday defining the start of Sabbath you risked raising the hackles of the Master of the Universe. Probably both explanations were brought forward by clergy who saw diminished collection plates with those who ventured out on Fridays. DON’T LEAVE HARBOUR INTO A STORM, is basic good sense. But, if I had obeyed that rule I would have missed a most interesting sail. I had planned Tuesday two weeks ago to head out for three days of sailing, probably the last of the year. I packed Canadian Mist and was off from Big Sound Marina. You remember that Tuesday; south-south-wester screaming down the harbour. It was gale force but not a storm, so I set off. I thought the wind had enough west in it that it would be close to my nose across the Sound, so I motored to three mile point. By then the wind had backed to south. 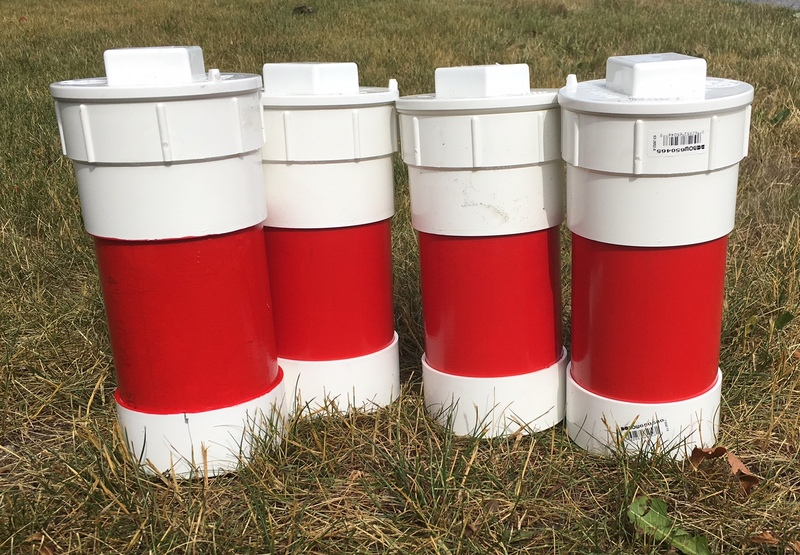 I ducked behind the light house and put up some sail: double reefing the main and storm jib. What a great sail it was as Killbear, Carling and then Spruce Rocks passed by. 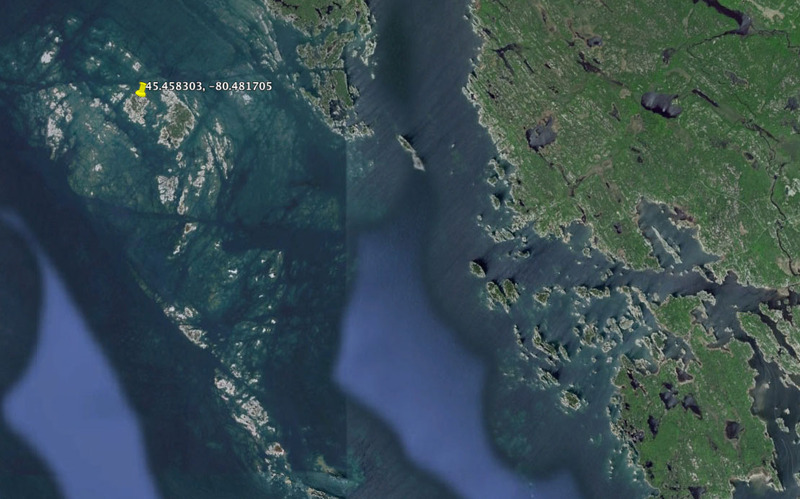 I adjusted sail to go north of the Pancakes, through the narrow channel past Fitzgerald Bay, and on to Snug Harbour. Ah, Regatta Bay to myself! After mooring in the centre of the bay and rowing Maggie to shore, it was time to light the barbecue. High winds and barbecues don’t fit well together. Eventually the chicken was done and the rice was ready. While cooking I heard the deep rumble of a large engine and looked out to the small craft route. Two bright red lights in a vertical line passed slowly by. With all my sailing I have never seen a tow at night. I’m not sure about the two red lights either; but my rule for night sailing is, if you can’t recognize it stay away from it. Not that I have ever sailed at night through the unlit buoys at Regatta Bay. The wind was still screaming over the trees so I let out a little more rode and got ready for the night. Within five minutes the propane tank ran dry; the cabin temperature was ten degrees and falling. The alcohol stove would have kept the cabin warm but alcohol and flame equals heat and all kinds of condensation. Rule that idea out. Have a look at Maggie. Hmmm, you have heard of a ‘three dog night’? In southern climes it works with one dog. So I cleared the sails to one side of the V berth, helped Maggie onto the sleeping bag and convinced her to lie on my feet for a while. A dog on your feet is like a dozen hot water bottles that never get cold. I was warm for the night; the last time for quite a while. By morning the strong wind had clocked west. The forecast was for minus one. We decided that three days had just become one. Maggie always agrees with me. After a quick coffee, I started the engine and hauled the anchor. After strong winds, first from the south and then west, it was stuck – I mean really stuck on the clay bottom. No problem, except that this hadn’t happened for years. I pulled the rode in tight and tied it to the cleat, went back to the engine and ran the boat forward. Just like magic; we were free. By this time even my raincoat wasn’t working that well. I was cold and wet so we motored to Kilcoursie Bay for breakfast. The wind had slackened a little but I decided to motor home. Canadian Mist has a dodger that is an effective spinnaker with a tail wind. With the engine I would be able to control speed and not swamp the dinghy. On Wednesday, as you may remember, the wind shifted west and rose. 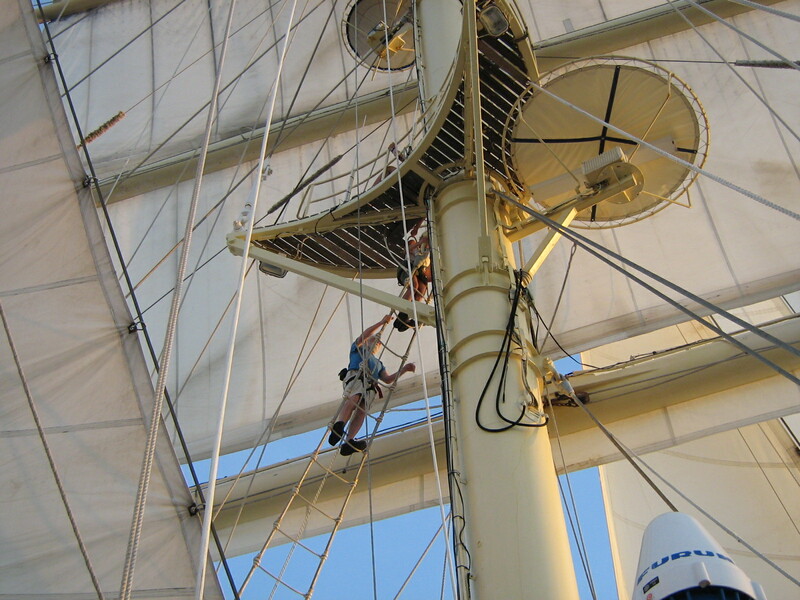 Sailing under bare poles, a dodger, and an idling engine while still doing five, sometimes six, knots is memorable. It was quite lumpy coming back across the Sound and the auto helm was baffled by a following sea. The dancing I did to stand and steer came back to me that evening. As I ate supper the chair I was seated on seemed to move.